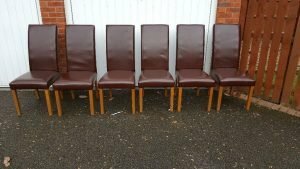 A set of six high back dining chairs on solid wood legs, upholstered in chocolate brown faux leather. 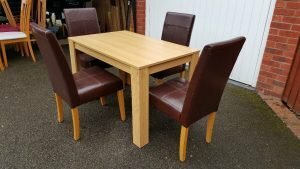 A large solid pine rectangular dining table, together with four matching high back dining chairs. 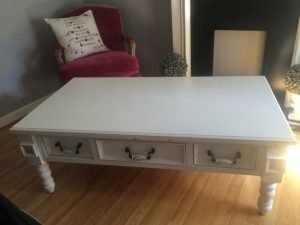 A hand painted white solid wood three drawer coffee table, together with a vintage high back fireside armchair. 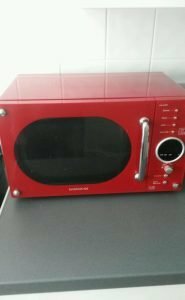 A red retro style Daewoo 800w microwave oven. 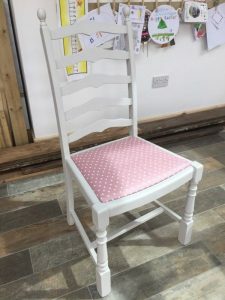 A hand painted white solid wood ladder back dining chair, upholstered to the seat in pink and white polka dot fabric. 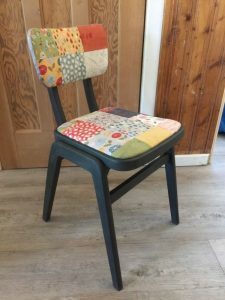 A retro black solid wood high back hall chair, upholstered to the backrest and seat in patchwork fabric. 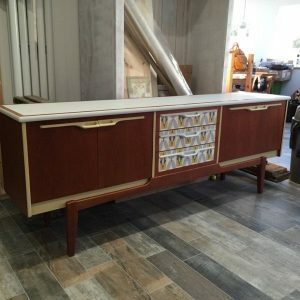 A large vintage solid wood sideboard, having a double cupboard to either side of three central drawers. 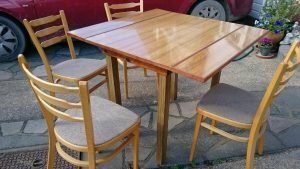 A large solid wood vintage drop leaf dining table, together with four matching ladder back dining chairs, upholstered to the seats in grey fabric. 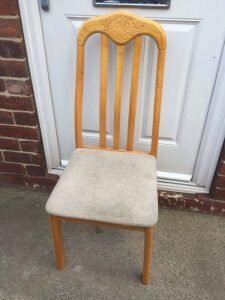 A vintage solid pine high back dining chair with carving detailing, upholstered to the seat in grey fabric. 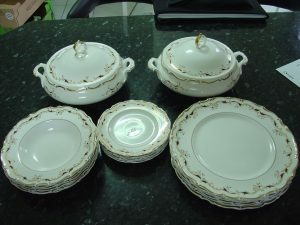 A Royal Doulton Strasbourg patterned part dinner service, to include dinner plates, side plates, bowls and two lidded casserole dishes. 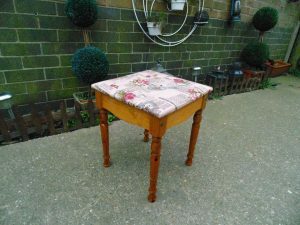 A large solid pine square vanity dresser stool, upholstered to the seat in patterned pink fabric. 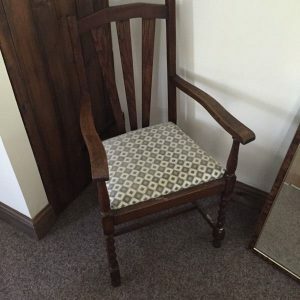 A solid oak vintage high back armchair on barley twist legs, upholstered to the seat in patterned grey fabric. 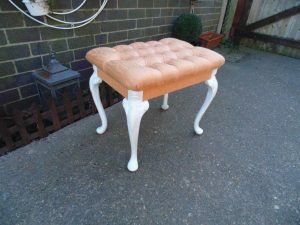 A hand painted white solid wood vintage vanity dresser stool, upholstered to the seat in salmon pink fabric with button detail. 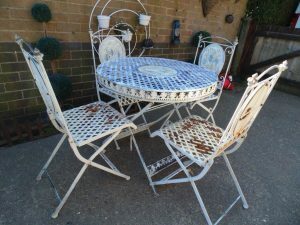 A white painted cast iron circular garden dining table, together with four matching dining chairs. 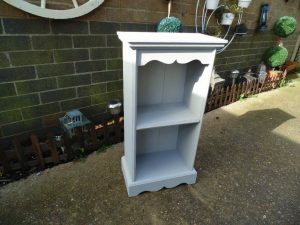 A hand painted white solid wood one shelf unit, in the shabby chic style. 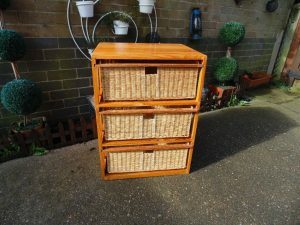 A tall solid pine bathroom unit, having three large wicker drawers. 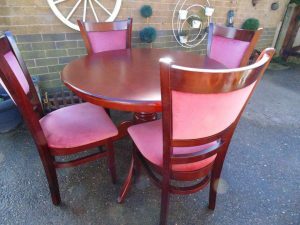 A vintage solid mahogany circular dining table, together with four matching curved back dining chairs, upholstered to the seats and backrests in pink velour. 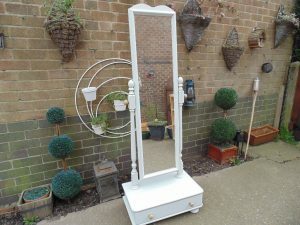 A hand painted white tall standing hallway swing mirror with one drawer to the bottom. 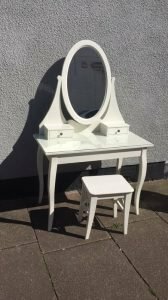 A hand painted white glass topped solid wood vanity dresser, together with a small matching stool. 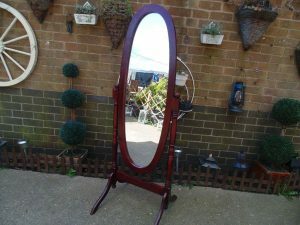 A tall standing solid mahogany oval bevelled swing mirror.